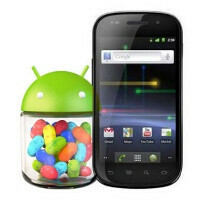 The Samsung-made Google Nexus S has already started getting the latest Android, 4.1 Jelly Bean. The first users got the update over the air just a few hours ago, and for the few that got it, the experience went smooth and the handset is running good after the update. Right now, it seems that the Google Nexus S with model names i9023 and i9020T are getting the update, with some devices in Asia landing it first. 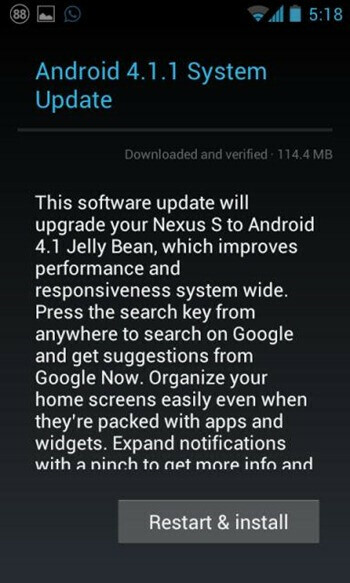 The update weighs 114MB and bumps the Nexus S up to version JRO03E. Of course, you shouldn’t lose any of your data during the update. hmm actually there are quite a few roms for JELLY BEAN on the galaxy s and whilst they arent complete some of them are getting on their way to being so. http://forum.xda-developers.com/showthread.php?t=1747042 Now I suppose it isn't an "official" jelly bean build by samsung, but its a rom made by the developing community which is a huge for android phones. So many people complain about updates on android etc etc when in actual fact if you really want the update in most cases (if your phone is at least mildly popular) there is usually a rom for it on xda 3months or so after the release..